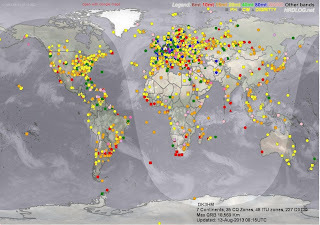 I just put together a page on my blog that maps all my QSO's. Its pretty cool - you can click on any of the houses and it will show you the call and the mode/band. I thought I would share with you how I did this. Export an ADIF file from your logging program. It needs to have the grid squares included in the export. Then visit ADIF to Map and follow the instructions. Download the KML file. This is where it gets tricky if you are using Blogger. You need to upload your KML file somewhere on the web. You have to be able to have a URL for the next step that points to your KML file. I have a self hosted web site that I could upload it to - so this worked for me. I am sure there are other options, but you will have to explore this. Once you have your KML file uploaded visit this Google Gadget page for complete instructions on how to finish this and embed the file on your blog. Its really just something fun to play with. I really enjoyed seeing that one way over there in France! I hope to add more of those shortly. There is one problem - for the SOTA activators I have worked - my logging program pulls in the grid square of their QTH as listed at QRZ.com. I have not gone in and manually updated those records with the grid square for the summits - I should probably do that.